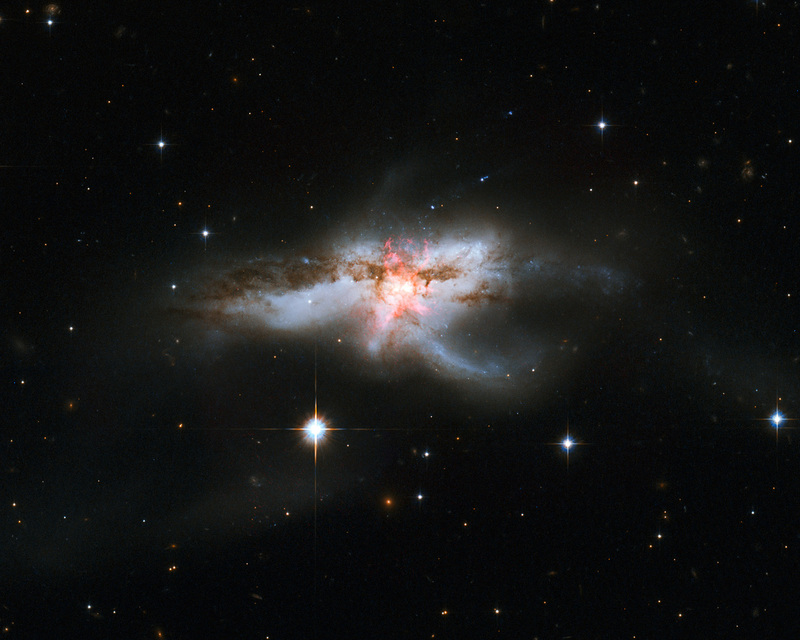 Not all galaxies are neatly shaped, as this new NASA/ESA Hubble Space Telescope image of NGC 6240 clearly demonstrates. Hubble previously released an image of this galaxy back in 2008, but the knotted region, shown here in a pinky-red hue at the centre of the galaxies, was only revealed in these observations from Hubble’s Wide Field Camera 3 and Advanced Camera for Surveys. 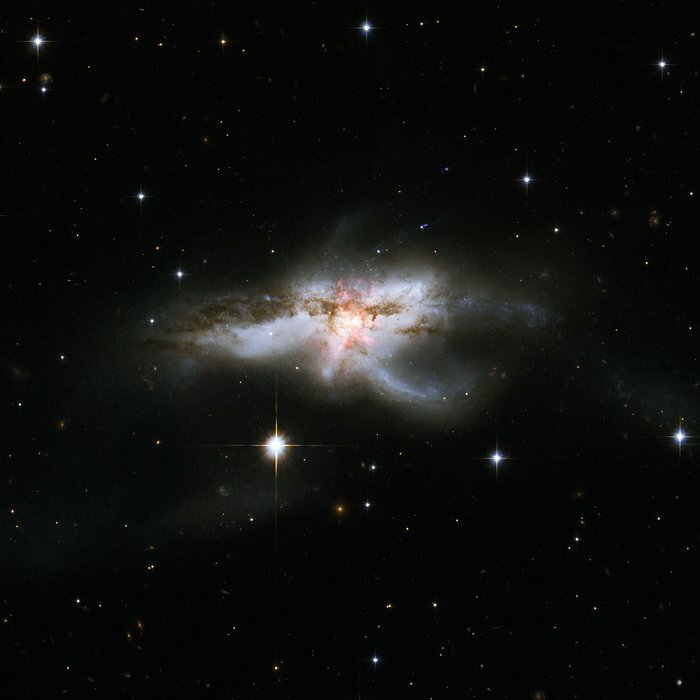 NGC 6240 lies 400 million light-years away in the constellation of Ophiuchus (The Serpent Holder). This galaxy has an elongated shape with branching wisps, loops and tails. This mess of gas, dust and stars bears more than a passing resemblance to a butterfly and, though perhaps less conventionally beautiful, a lobster. This bizarrely-shaped galaxy did not begin its life looking like this; its distorted appearance is a result of a galactic merger that occurred when two galaxies drifted too close to one another. This merger sparked bursts of new star formation and triggered many hot young stars to explode as supernovae. A new supernova was discovered in this galaxy in 2013, named SN 2013dc. It is not visible in this image, but its location is indicated here. At the centre of NGC 6240 an even more interesting phenomenon is taking place. 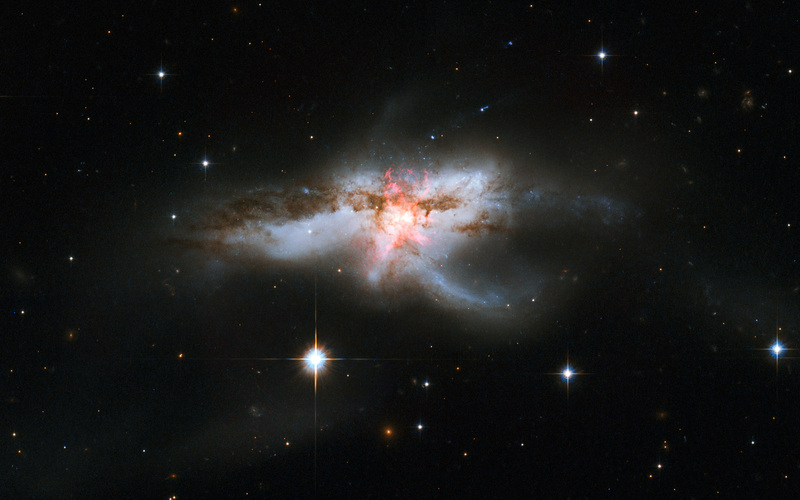 When the two galaxies came together, their central black holes did so too. There are two supermassive black holes within this jumble, spiralling closer and closer to one another. They are currently only some 3000 light-years apart, incredibly close given that the galaxy itself spans 300 000 light-years. This proximity secures their fate as they are now too close to escape each other and will soon form a single immense black hole. Position (Dec): 2° 24' 4.47"